How much were the seats? Do you have season tickets? Anyone know why Jonathan Simmons not getting any play time tho? This is key. I still think jj is going to still be one of the most important pieces similar to what klay is to GSW. D Fly, mastamind033, amitt5504 and 1 other person like this. 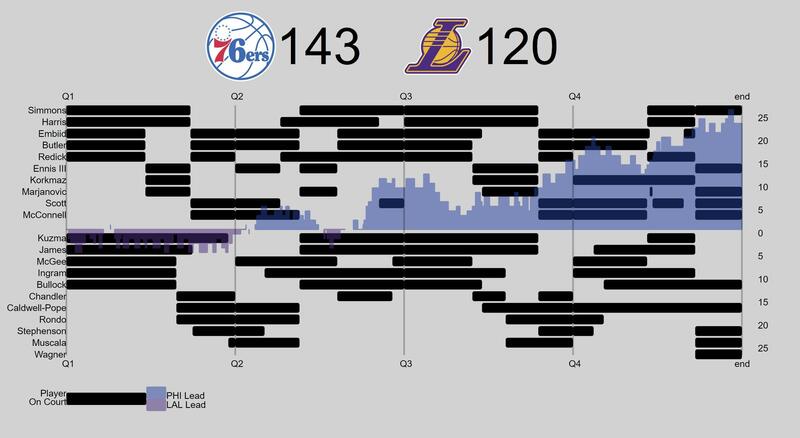 The Sixers are legitimately ****ing good after the Tobias, Boban, Scott, Simmons and Ennis pickups. Like....this team is a legit Finals contender that could even hang with the Warriors. 33 assists and 8 turnovers. Our best game holding onto the ball. With the amount of possessions and high pace this game, 8 turnovers is amazing. Let's hope we keep it up for the rest of the season. Scott/Simmons/Ennis are all long enough and athletic enough to switch onto most players. Far more up to task than Dario, Ilyasova, or Bellineli. When the rotation shrinks (I know Brett said he might run a 10 man rotation, but really if it comes to 8 or 9) you can keep 5 guys on the floor at all times that are no shorter than 6'6" (minus Redick/TJ) on top of the fact you'll be able to keep at least 2, and sometimes 3, 17ppg scorers on the floor at all time. The moves Brand made at the deadline really addressed just about every need this team had - shooting, bench depth, serviceable backup to Embiid, another athletic wing that shoots the 3 at a high clip AND as an added bonus can create his own shot. I know a lot has been talked about how much Redick benefits from these moves because you can hide him on defense now, but I think these moves oppositely and equally do the same for McConnell. Because McConnell takes most of his shots within 15ft, it was a real problem at times finding spacing with him running the show (especially with Ben out there at the same time) but now you can surround him with some combo of Embiid/Redick/Butler/Harris/Scott/Ennis and open up the floor. We still have two meetings with the Celtics, two with the Bucks, 1 with the Dubs, and 1 with the Thunder. Going to be really telling of this team how we fare in all those matchups. I'm most intrigued to see the Dubs matchup. Beating them on their floor (albeit without Klay and us without Harris/bench pickups) gives me a lot of confidence heading into a Saturday night prime-time matchup on our floor. I sincerely believe that this Sixers team could give the Dubs the most troublesome matchup they've had to face during the Durant era. AI'sMyGOAT, Moheezy and buc em like this. buc em and Moheezy like this. God I hope we destroy the Celtics tomorrow night. My birthday is Wednesday. Would make for a good present. dat dude chris and Olympus like this. I like how we can switch everything now. It's also interesting that Brown is playing Boban over Jonah. I'm not sure who is better, I'll have to say it's a matchup thing. Also, speaking of rotations, the TJ/ Simmons experiment is eliminated. Brown pairing Tobi with Simmons while paring JJ, Butler, and Joel together. We had two all-stars on the court at all times. You really can’t hide your worst defender on anyone in the starting 5 anymore. Even if you put them on Ben you can run some action to force a switch or he can just punish them in the post. last night he went 6-10 and 2-2 at the FT line.. It's his old reputation that still haunts him. I love what Jimmy brings so far and I hope the media continues to hate on him and exaggerate any negative word he says. The less other teams want him, the better for us. I think so too. And it will be evident in the coming days. AI'sMyGOAT, Olympus, buc em and 1 other person like this. thapointguy and buc em like this. Tonight's a game I though would be better for Jonah to play instead of Boban as the Celtics are taking advantage of his slow footing. Knowing coach, doubt that will happen. I'll say it now, the refs sucked tonight!!! That no-call on JoJo when he was mugged across both arms!! That would have tied it with 2 FTs. And earlier, they called Ben for a travel but before that, Tatum has both hands on him! Didn't know they changed the rules to allow defenders to use both hands! They played poorly tonight, but they didn't get any calls while Boston got a bunch of ticky-tak fouls! Refs were trash as usual but we were bad as a whole getting Embiid set up.